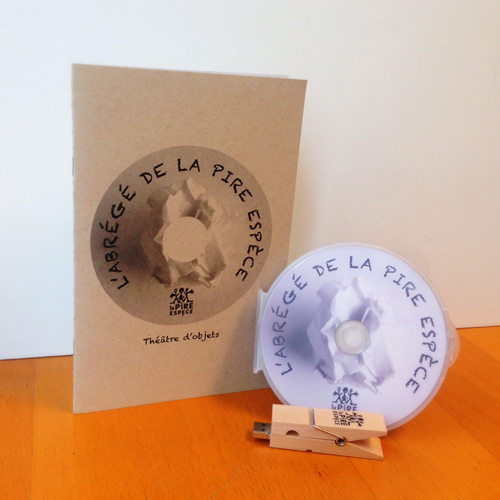 La Pire Espèce has been offering a series of workshops for high school age youth for the past 10 years. By offering these students a comprehensive look into object theatre, from getting started, to manipulation,to producing a final, original creative project, we hope to share and pass on our knowledge of this art. Each workshop is designed for a maximum of 30 participants and led by the company’s professional artists. This workshop offers a crash course in the expressive power of the object and in general manipulation techniques, drawing on excerpts from our legendary show, Ubu on the table. In this series of three classes, students will discover the object’s expressive possibilities and will practise different manipulation techniques. They will then be asked to create short pieces using objects as characters or symbols, under the watchful eye of their trainers. Good to know: this workshop can be funded through cultural workshops at school as part of the Culture at School program. Check the admission requirements here. In this serie of three classes, students will discover object’s expressive possibilities and will practise different manipulation techniques. They will then be asked to create short piece using object as characters or symbols, under the watchful eye of their trainers. Have one of these workshops sparked your interest? Get in touch with us for more information and to find out about our rates. Enrich your students’ theatre experience!